Wa-Wow! Way to go Vanessa! Beautiful peony and man you colored it amazingly! I'm checking this out, wish I was handy with those digi's I'm not good at sizing them and modifying them at all. Headed to Etsy! Congratulations! Your granddaughter sounds as if she is quite accomplished already! Beautiful image and beautifully colored! She obviously gets her talent from her grandmother, LOL! Bravo Vanessa! Your talent is amazing like your grandmother's. I can tell talent runs deep in your family. Maria, I know you are beaming with pride. Beautiful card, Maria. Love that your granddaughter is getting into this craft we love. TFS. Enjoy your day! A beautiful image, beautifully coloured Maria. Gorgeous! I can see where your granddaughter gets her artistic talents from! Thanks for sharing your card with us at Hand Stamped Sentiments! Maria, your granddaughter does amazing work and your card has showcased it beautifully! May she have great success in her artistic endeavors in the future. Wonderful card! Thank you for playing with us at Hand Stamped Sentiments and hope you can join us again soon. You and your granddaughter are truly talented. She created a beautiful image and you colored it with such beautiful technique. So soft and with so much depth of color. Thanks for sharing and for stopping by Hand Stamped Sentiments! Wow! That is an incredibly gorgeous image, and your coloring of it is absolutely amazing!!! Congrats to your Granddaughter! Such a beautiful card - love to see your granddaughter following in your artistic footsteps. I also love the stitching you've added and the fact that the stitches are wavy. I might have to Case that! 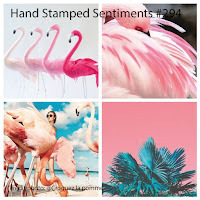 Thanks for joining us at Hand Stamped Sentiments this week. Sorry I am so late to comment I have been having WEB WOES!! Vanessa is truly just at the beginning of her art/ career and how she is just bursting with talent and artistic ability ! Between the two of you I would have to say WATCH OUT HALLMARK !!! Loved reading the info you linked us to ... I remember how excited you were when she had that famous trip to WASHNGTON !! This card is just beautiful !! I am requesting more from you two talented ladies !! Wow Maria your grand-daughter is one seriously talented woman!! Your card showcases this flower beautifully and I'm off now to look at more of her designs in her Etsy store. This image will go straight to my digi files as soon as I get my desktop computer back. I love the soft lines of her illustration, and Vanessa's skill as an artist is very evident. It's so beautiful! And you've shown just how gorgeous it looks colored up with your Prismas. I'm totally in love! Count me as a new fan of Vanessa's. I hope to see more from her! Very pretty card! You did a great job with the coloring! Thanks for playing with us at HSS. Beautiful card and great colored! Greetings to your granddaughter Vanessa, she is very talented! How wonderful! She is truly talented (I know where she gets it from! ), I adore the beautiful colours that you chose and how you kept the image the main focus. Wow, Maria! I love your card and your amazing coloring, and I really love this digi that Vanessa designed. It's so beautiful and lends itself to different coloring media. Looking forward to using it. I just read Vanessa's story, and she is beyond accomplished! What an amazing young woman, and I know she has a promising future ahead of her. So many gifts and talents, and I trust that she will enjoy each of her areas of interest and activities. She sounds so much like her grandmother with the sports too. Surely you've had a great influence on her life. 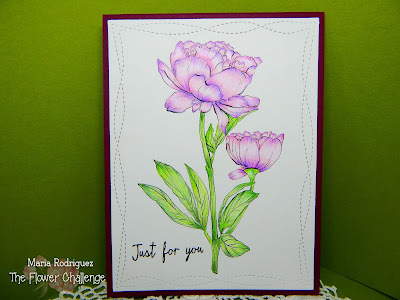 Anyway, I love your card with this stunning flower, and what a perfect and elegant way to finish it with the wonky stitched die and simple sentiment! Beautiful, sweet friend! Hugs!